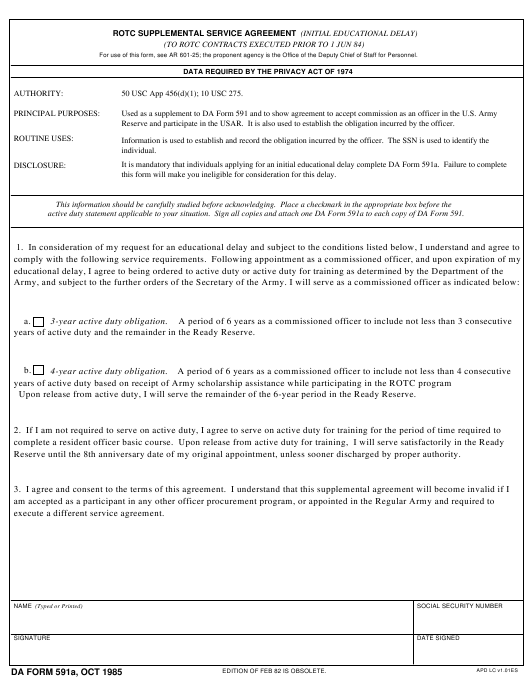 DA Form 591A - also known as the "Rotc Supplemental Service Agreement (initial Educational Delay)" - is a United States Military form issued by the Department of the Army. The form - often mistakenly referred to as the DD form 591A - was last revised on October 1, 1985. Download an up-to-date fillable PDF version of the DA 591A down below or look it up on the Army Publishing Directorate website. Reserve and participate in the USAR. It is also used to establish the obligation incurred by the officer. this form will make you ineligible for consideration for this delay. active duty statement applicable to your situation. Sign all copies and attach one DA Form 591a to each copy of DA Form 591.
years of active duty and the remainder in the Ready Reserve. Upon release from active duty, I will serve the remainder of the 6-year period in the Ready Reserve. Reserve until the 8th anniversary date of my original appointment, unless sooner discharged by proper authority. EDITION OF FEB 82 IS OBSOLETE.